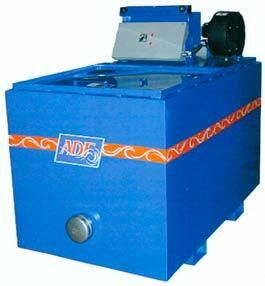 ADF Evaporators are designed to economically reduce waste disposal quantities by evaporating water from parts washer solutions, water soluble coolants, ink wastes, and compressor and mop water. The evaporators can be used as stand alone units or connected to a customer owned holding tank with an auto fill system for continuous operation. Tanks are constructed of stainless steel with 2” of insulation for economical operation. Tank bottoms are sloped for easy sludge removal through a large 4” NPT fitting. High temperature limit switches maintain a constant tank temperature and low liquid level sensors are standard. FIVE GALLON PER HOUR: This is an electric heated model with an 85 gallon holding tank evaporating 5 GPH. TWELVE GALLON PER HOUR: This larger evaporator has a 150 gallon tank and is available with both electric and gas heat evaporating 12 GPH. Other sizes are available on a custom built basis.